When KION’s manufactured forklifts began experiencing weather damage during production, the job went to Don Yanzer to find a solution. KION North America, a manufacturer of material handling products, is just one company under the larger global umbrella of KION Group. With a history traced back to Germany in 1879 under the Linde brand name and extensive experience providing successful solutions, it is evident KION values constructing quality products for their customers. Don Yanzer of KION North America said, "We are unique, because we are large enough to get the job done and small enough to care about each customer." When KION's manufactured forklifts began experiencing weather damage during production, the job went to Yanzer to find a solution. "My role as the industrial engineering manager has provided me an amazing opportunity to grow and expand our Summerville facility." This included adding a ClearSpan Gable HD Building for storage, which Yanzer noted blends extremely well with the company's existing building. 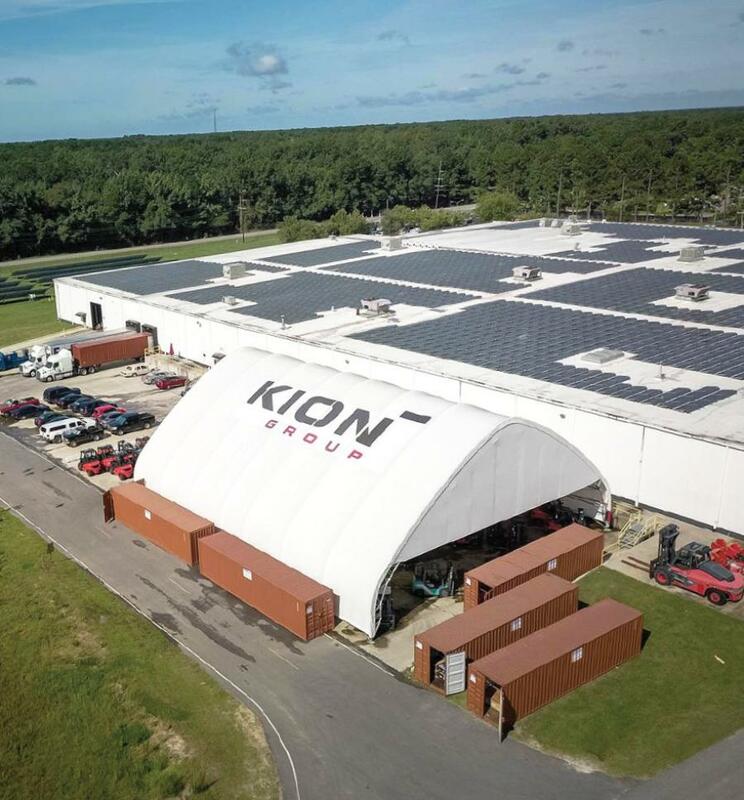 Those at KION North America performed extensive research before deciding to utilize a fabric structure, and even more prior to choosing ClearSpan as their manufacturer. "As a responsible company, we explore many options and price points," Yanzer said. "Ultimately, the decision was based on the type of equipment, years of life expectancy, quality of product and company reputation for service and project completion. We also selected this type of building because we are able to extend the building another 100 feet in the future if needed." Since its implementation, the ClearSpan Gable HD Building surpassed KION's forklift coverage needs. "The fabric structure eliminated any sun damage and keeps rain off the product. This also helped with safety, keeping equipment dry with no slippery surfaces," Yanzer said. He also noted an added benefit of the fabric building and said, "We like that while everything is covered, the white fabric allows plenty of light inside, so no additional lighting is required." According to Yanzer, he is very happy with his ClearSpan experience and the resulting structure. "The ClearSpan product is very good. The guys who installed our building were the absolute best. As a manager, I perform employee reviews and the ClearSpan Installation Team would get all 10's, they are that good. The team was safe working, professional, friendly, excellent work knowledge and work ethic was the best." For more information, visit www.clearspan.com.